Your channel trailer is like a movie trailer—use it as a way to offer a preview of your channel so viewers will want to subscribe. What should go into it? Think about the unique qualities of your channel, your personality, and why viewers should feel compelled to return. There are many ways to make a channel trailer, but consider starting with something that hooks your viewers in the first few seconds and then highlighting the best parts of your channel. You want to give your viewers a lasting impression, so end with an explicit ask for viewers to subscribe. Ask viewers to subscribe in your video. Your trailer will automatically have an end card when the video finishes, giving the audience an easy way to subscribe. Be sure to enable your channel trailer. The WhatsUpMoms trailer opens with an introduction from the host and then shows highlights from the collection. At the end, she asks viewers to subscribe and includes a subscribe button. Check out the channel to see a succinct description too. Soul Pancake's trailer opens with a captivating, emotional monologue from their host, Kid President. Colorful imagery and light music help to capture the essence of the channel in their introductory video. 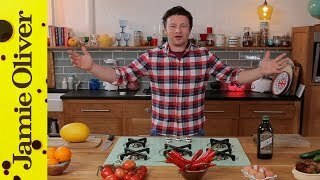 In this trailer, the host, Jamie Oliver gets right to the point and urges viewers to subscribe. 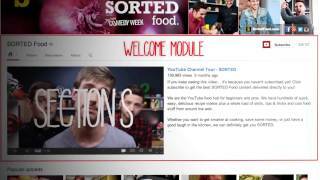 The trailer illustrates the types of foods and personalities viewers can expect to find on this channel. The channel description is text that conveys key information about your channel—search engines use these words so people can find you. When an unsubscribed viewer comes to your channel, they will see both your channel trailer and channel description. When viewers read it, they should have a pretty good idea of what your channel is about and know where to go for more information. Use action words to compel viewers to subscribe or watch a playlist. Check how your description displays on mobile and other areas of YouTube. Before you get started, it’s important to plan your video. Think about who your audience is, write your script or talking points, and plan your creative. Here are some tips for each. What should the tone be? What do I want them to listen to? Will it be playful, serious, comedic, or informative? What are the color schemes and fonts? Writing a script or talking points before starting is critical for success. A structure with a clear and captivating message from start to finish can help your trailer get subscribers. Think about the words and images that actually appear on screen, and the sound and music viewers hear. They should all clearly communicate the message of your channel and match its ”look and feel” (your branding). It’s important to tell viewers what to do next—so end with the name of your channel and tell them to watch more videos on your channel! Try creating a simple, yet consistent background for all of your graphics and grab your channel’s font and style to create individual graphics based on your script or talking points. Legibility is key. When you have the right music, you can emotionally move your viewers. Music keeps viewers engaged and sets the tone and energy. So pick music that is consistent with your words, graphics, and brand. Why do you think Amazing Phil’s channel trailer sounds like a video game? Check out ready-to-use music in the YouTube Audio Library. A successful channel trailer doesn’t need to have a montage of clips—you can use just one or two great clips or even an original shoot. If you use a montage of clips, show the variety of material featured on your channel. Decide if your trailer is too long, too short, or just right by looking at drop offs in viewership in the audience retention report. By looking at the average watch time of your channel trailer in YouTube Analytics you can see how much of your channel trailer viewers are watching.